Masood Noori had the most liked content! ghair e zimmadar badtameez nahi...koi Zimmadar bhai jawab den..
Barakaat E Huzoor Muhaddith E Kabeer : Tahaffuz E Sunniat. More @ http://www.ziaulmustafa.com/ Huzoor MuHaddith e Kabeer Manaazir e Ahle Sunnah Hadrat Allamah Mufti Ziaul MuStafa SaHib Qadri Ridawi is a Great MuHaddith and Faqeeh e MoAtamad of our times. A strong Pillar of Maslak e Aala Hadrat AlayhirRaHmah, Hadrat at this ripe age of around 80, has astonishing stamina to counter the firqa e baatilah whenever occasion arises. With his heart glowing with thousands of Ahadith of Beloved Prophet Sallallahu Alayhe wa aalihi wa Baaraka wasallam, Hadrat is a man of wisdom and piety, quite humble to meet and bless general muslims. He is like a calm and deep ocean filled with precious pearls but suddenly turns into a fiery roaring tsunami for the baatilah whenever they play foul and Hadrat is called there. With shining inputs from Hadrat's official website http://www.ziaulmustafa.com/ i would like you to get close to Hadrat's brilliance and depth of knowledge of the Shariah Mutahhirah. Huzoor Muhaddith-e-Kabeer, Sultaan Al Asaatiza, Khayr Al Azkiya, Mumtaaz Al Fuqaha, Khaatam Al Fuqaha, Sayyid Al Mufassireen, Munaazir-e-Laa Thaani, Gazaali-e-Doraa, Raazi-e-Zamaan, Muhaqqiq-e-Masaa'il-e-Daqeeqah, Khateeb-e-Aalam, Mufakkir-e-Razviy Hadrat Allama Zia Al Mustafa SaHib Qadri is the son of the great Sadr Al Shari'ah Allama Amjad Ali Qadri Radi Allahu Anhu. Allama Sadr Al Shari'ah was deeply loved by Imam Ahmed Raza Khan Radi Allahu Anhu, Ala Hazrat strongly relied on Allama Sadr Al Shari'ah's fiqh up to the extent that he said if there was Islamic ruling, I would say Sadr Al Shari'ah should be the Qaadi (The Judge). 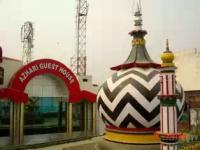 Ala Hazrat was the one who gave him the title "Sadr Al Shari'ah" which means "the Leader of Shari'ah". Ala Hazrat said to his son Hujjah Al Islaam Hamid Raza that if you know such and such Dua's then you may lead my Janaaza Salah otherwise Sadr Al Shari'ah will lead it. Allama Sadr Al Shari'ah has a lot of students who became great scholars of their time, such as Huzoor Hafiz-e-Millat (the founder of Al Jamiah Al Ashrafiah, Mubarakpur), Allama Naeem Al Deen Muradabaadi (the author of Khazaa'in Al Irfaan, the commentary on Ala Hazrat's Kanz Al Imaan), Mufti Aazam Pakistaan, Allama Waqar Al-Deen and other great scholars. Allama Zia Al Mustafa began his studies directly from his father, the great Sadr Al Shari'ah and later went to Mubarakpur and studied under the shade of his fathers student Huzoor Hafiz-e-millat and Hazrat Allama Abd Al Ra'oof another great scholar. Allama Zia Al Mustafa deeply loves these two teachers of his and he mentions them a lot as well. In Mubarakpur Allama Sahib studied different types of Uloom and Funoon such as Ilme Qur'aan, Tafseer of the Qur'aan, Hadith, Usoole hadith, Fiqh, Usoole Fiqh, Ilme Ta'beer (interpretation of dreams), Ilme Tawqeet (Namaaz times), Ilme Nujoomi (Astronomy), Philosophy, Mantiq (Logic), Ilm-e-Falakiyaat, and the list goes on and on. He graduated with all that knowledge at the age of 19. One year after graduation his teacher Huzoor Hafiz-e-millat called him back to Mubarakpur and made him sit in his classroom in which he taught Bukhari Shareef, after 3 lessons Huzoor Hafiz-e-millat told him this how you must teach Bukhari. This was a glad tiding for a scholar of such young age that later on the years you will be a Sheikh Al Hadith and will teach Bukhari. It wasn't long when he was given the title "Muhaddith-e-Kabeer" which means "Great Muhaddith". He was such great in Fiqh that he was given the title "Mumtaaz Al Fuqha" which means "The Unique one from all Jurists". The titles that Allama Sahib has been given were all gained by him and given to him by great scholars. After Allama Sahib graduated from Mubarakpur he took part in a competition, the competition was on the topic of Fiqh. The winner would be given the title, "Mumtaaz Al-Fuqaha". Allama Sahib was competing many many scholars from all around India. He came first and was given the title. In Banaras, U.P, India, A Munazarah took place between the Ahl-e-Sunnah and the Ahl-e-Hadeeth. Huzoor Mujaahid-e-Millah, Allama Arshad Al-Qadri and mufti Shareef Al-Haq were present in Banaras to debate for the Ahle Sunnah. Allama Sahib was very young and was at home in Ghosi. He was not supposed to be taking part in the Munaazarah, however, the three previous mentioned great Ulema decided to call Allama Sahib, they felt a need for his presence. Remember Allama Sahib was very young at this time. Allama Sahib had to leave Ghosi straight away, he travelled in a local train, standing all the way tillBanaras. He was chosen by the Ahle Sunnah Ulema to be the Munaazir from the Ahle Sunnah side. He debated, and finally Ahle Sunnah won the munaazarah. Huzoor Mujaahid-e-Millah said after the Munaazarah astonished by Allama Sahib's level of understanding the uloom of Hadith, "Surely Mowlana Zia Al-Mustafa is not only a Muhaddith but is Muhaddith-e-Kabeer". This was the very Munazarah because of which Allama Sahib is called, "Faatih-e-Banaras". Allama Sahib was given the title "Sultaan Al-Assatizaa" in the urs of Allama Arshad Al-Qaadri two years ago. Whilst Allama Zia Al Mustafa was in Mubarakpur he was given Khilafah by Huzoor Hafiz-e-millat. During his stay in Mubarakpur Mufti Azam-e-Hind, the son of Ala Hazrat demanded his presence in bareilly, when Allama Zia Al Mustafa reached Bareilly he was given a Khilafah by Mufti Azam-e-Hind and permission to read and act according to a pamphlet called "Sayfi Shareef", this is a book which only a few people have permission to use, it is full aamaal to get rid of black magic and Jinns, to use this book one has to obide by a lot of rules, Mufti Azam-e-Hind loved Allama Zia Al Mustafa so much that he gave him permission to use that book without need to obide by any of the rules. Allama Zia Al Mustafa once used an amal from "Sayfi Shareef" to get rid of a Magicians magic which he used against the muslims in Mauritius (the Frenchireland), he was successful and that is the very reason why he has a lot of mureeds and followers in Mauritius. Huzoor Hafiz-e-Millah, many a times in his life said to people, "All that Sadr Al-Shari'ah gave to me, I have given to Mowlana Zia Al-Mustafa". Allama Zia Al Mustafa remained the principle in Al Jamiah Al Ashrafia for many years and the Sheikh Al Hadith for a few years. He is running two Daarul Ulooms in his own village, one for the boys called "Al Jamiah Al Amjadia" named after the great Sadr Al Shari'ah Amjad Ali and one for girls which was started by his mother, the wife of the great Sadr Al Shari'ah and the sister of the great Raees Al Qalam Allama Arshad Al Qaadri. She was a great Aalimah and a great Aamilah. That darul uloom for girls is called "Kulliyah Al Banaat". Allama Zia Al-Mustafa has written and checked many Fatwa's in his life time. If his fatwa are gathered they would no doubtedly reach to thousands. Today he is not just a Mufti but he is a guide for the Muftiyaan-e-Kiraam. There a lot of other great works he has done which I have not mentioned but what i can say is that I have never seen a greater or better scholar than him in this time. May Allah increase his knowledge, Taqwah, and work for Deen, may Allah give him fame, may Allah increase his life for the good of Muslims and may Allah give him Shifaa from all illnesses and problems. May Allah send his blessings on the souls of all the great scholars i have mentioned above, Ameen. Finally may Allah give us the Tawfeeq to live like the great scholars, Ameen. Wassalaam. Pic Of Ala Hazrat Imam Ahmad Raza (R.h) Is Real Or Fake ?